Staff photo by Doug Strickland / Thomas Borrillo rides on his father Joe's shoulders as his mother Stephanie stands nearby during a demonstration in the parking lot of Delray Farms Fresh Market on Saturday, June 30, 2018, in Dalton, Ga. Dozens of demonstrators gathered to protest the detention and separation of immigrant families at the United States border. DALTON, Ga. — Protesters concerned with the Trump administration's immigration policies held a rally in a parking lot alongside Delray Farms Fresh Market in Dalton, Georgia Saturday. Attendees held signs decrying family separation, listened to speakers, sang and prayed for the future of the United States. 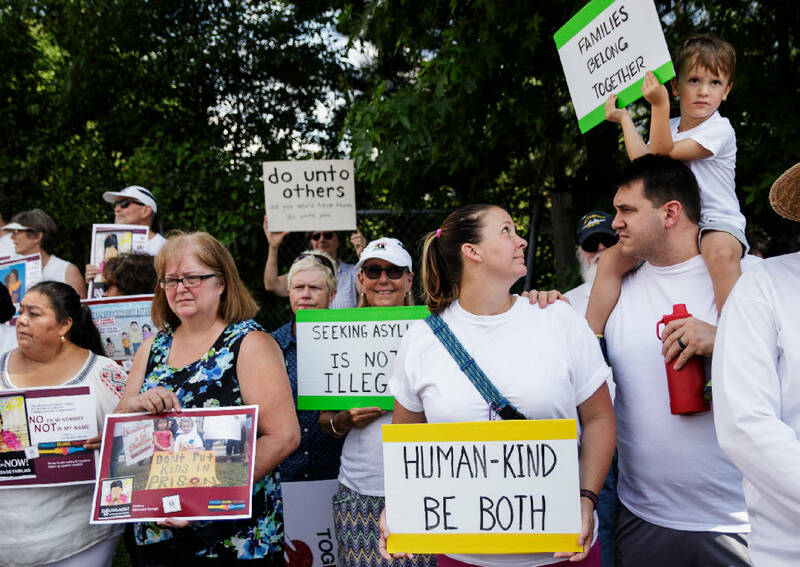 A similar event was held at Coolidge Park in Chattanooga and in cities across the U.S. as part of the nationwide "Families Belong Together" event. Most attendees voiced opposition to family separation carried out by the administration. President Donald Trump since has signed an executive order ending the practice. However, local event organizer America Gruner with the Coalition of Latino Leaders believes there's still more that needs to be done. Gruner would like to see policies that she believes created a crisis overturned. Many of the event's attendees agreed. "I came because I care," Dalton resident Joyce Oxford said. "I care about immigrants; I care about families; I care about children. I'd like to see the children reunited with the parents, improvements for ICE and more people who care." A man in a "Support Trump" T-shirt came to the event, quietly and peacefully standing in the crowd. The man, Dalton resident Allen Gillespie, said his son broke the law and has been incarcerated for 12 years, away from his family. "It's just a simple thing. If you break the law, you're going to be separated from your family," he said. "That's my message." Gillespie came to the event to show his support for the president and to ensure people who agree with his immigration policies were represented, he said. Nearly 50 people were at the rally when it started, and the crowd grew throughout the event. In total, about 100 people came to the market to show their displeasure. However, as pastors, community members and others spoke, one Dalton woman had heard enough. Lou Wheat came to the front and asked to speak, a request that was denied by Gruner, who asked the woman to leave. Gruner later also asked Gillespie to leave and requested that media members not interview either attendee. "This isn't why we're here," Gruner pleaded. Wheat agreed to speak with local media outlets to share what she wanted to say to those in attendance. "It's really been bothering me how they get up there and talk about these children being separated from their parents and all," she said. "First of all, when you break the law, you're going to face the consequences. If they knew this was happening, why did they break the law and jeopardize their children and family and all? Why is it when my kids go to apply for a job, it says 'must be bilingual'? Well, you know what? My kids didn't take Spanish because we live in America." Two protesters, Stephanie Borrillo and Drina Haviland, came and stood behind Wheat with signs while she spoke and later debated with her about immigration policy. The women then gave a tearful interview about the event and immigration. "I'm heartbroken that our country would do this to the innocent children," Haviland said.